Plush cabled ribbing blends perfectly with a lightly textured body pattern to create harmonious contrast in this cropped cardi. 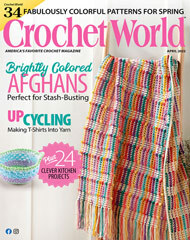 This e-pattern was originally published in the November 2009 issue of Crochet! magazine. Size: Includes women's small through X-large. Made with medium (worsted) weight yarn and size I (5.5mm) hook.